From humble beginnings, Walter Williams has grown a business that today has three farms as well as a fruit packing business in the Ceres Valley. He spoke to Denene Erasmus about his early days as a farmer and his tried-and-tested production techniques. Angus Williams shows off a healthy Cheeky pear. The newer, sought after fruit varieties are sold for a premium, especially in the export market. For the first-time visitor to Walter Williams’s farming enterprise in the Ceres Valley, it is hard not to be impressed. The trees in the large orchards are heavy with fruit, the micro-irrigation system uses moisture-logging probe technology, and there is an air of industry and efficiency everywhere. The operation is a family-run affair: Walter is assisted by his wife Helene, and his sons Angus, Walter Jnr and Justin. Speaking to Walter, however, you realise that the road to success has not been without obstacles. When he wanted to buy his first farm in 1978, money alone was not enough to ensure the transaction. Walter came to Ceres from Pniel, where he had been a fruit and vegetable trader. Here, in 1974, he started farming on a tiny smallholding, Die Eiland, which he leased from the government. Determined to expand, he purchased several farms over the years. ln 1978 he bought the 49ha Dwarsberg, and six years later purchased a 38ha section of the farm Loxtonia, which included 12ha of fruit trees. Walter Williams and his son Angus, the farm manager at Dwarsberg. In 1994, he was able to buy Die Eiland from the government and in 2000, realising the importance of controlling more of the value chain, bought Wallet Fruit packhouse, where the infrastructure comprises a packaging facility, cold rooms and packhouse. He packs and markets fruit produced on his own farms as well as on several other farms in the area. 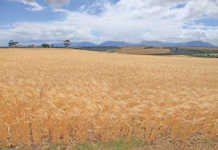 Five years later, Walter bought the 99ha fruit farm Stukkie Wit, increasing the total area on which he farms to 178ha. “The first and only support that we ever received from the government was in 2012, when the Western Cape Department of Agriculture gave us R1,5 million worth of equipment and machinery,” says Walter. 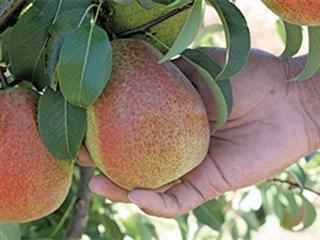 The family grows five types of fruit: peaches (fresh and for drying), nectarines, plums, apples and pears.Walter serves on the board of the South African Plant Improvement Organisation (Sapo) and keeps up to date with the latest developments in new fruit cultivars. He uses this knowledge to his advantage and has planted several of the newer and more sought after varieties for which he can earn a premium, especially in the export market. In addition, Walter and his sons also produce vegetables on a rotational basis on about 5ha, principally to maintain cash flow in winter when there is no fruit to harvest. 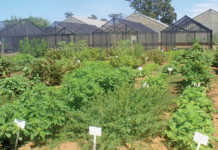 Onions, cabbage, cauliflower, broccoli and butternut are the main crops. Walter’s son Angus, who is farm manager on Dwarsberg, explains that they prefer to plant vegetables that are always in demand instead of the more expensive niche market baby vegetables. Walter employs specialist consultants to analyse soil samples for nutrient deficiencies and to determine fertiliser application accordingly. After the soil has been corrected, the irrigation system is installed and the young trees planted at a 4,5m inter-row spacing and 2m on the row. This same pattern is used for all fruit types. The consultants thereafter assist with fertilisation and spraying programmes. They also advise on various aspects of establishing new orchards, such as in which direction the rows of trees should be planted to enjoy optimal exposure to sunlight. The business employs 15 permanent and approximately 40 seasonal workers. Walter is worried that the recent increase in the minimum wage for farm workers will be unsustainable. Walter and his sons are systematically replacing their drip irrigation systems with modern micro systems as they replant the orchards. 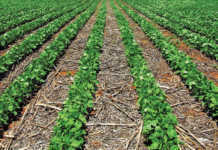 “The soil is sandy, so drip irrigation is less effective than micro-irrigation,” he explains. “A micro-irrigation system also creates a more favourable microclimate in the orchards, a real advantage in summer. It’s controlled electronically by DFM continuous logging probes, which help us to set the irrigation scheduling precisely. “We usually irrigate from late October until April, adjusting according to rainfall.” Planting new orchards has also given Walter the opportunity to introduce the latest cultivars that are sought after in the export market. “There’s never a quiet time on the farm,” says Walter. “As soon as we stop harvesting, we start the post-harvest fertilisation programme. Then we prune. And as soon as bud break starts, we begin spraying.” The fertilisation programme is based on regular soil and leaf analysis, and Walter and his sons stick closely to the consultants’ recommendations. They also follow the consultants’ advice on preventative spraying programmes, which are based on monitoring. A major threat is fruit fly infestation; contaminated fruit cannot be exported. Dwarsberg is taking part in the fruit industry’s drive to implement the internationally accepted sterile insect technique (SIT) in conjunction with a range of co-ordinated practices to control Mediterranean fruit fly. The technique involves mass-rearing the flies, sterilising the males with gamma radiation and then releasing them into orchards. The sterile males mate with wild females and the eggs laid are infertile. The continuous release of sterile fruit fly males ultimately results in the implosion of the population to very low levels and even to extinction. SIT is integrated with other methods such as targeted ground and aerial baiting, and traps in orchards. As both a farmer and the chairperson of the Deciduous Fruit Development Chamber, Walter is acutely aware of the impact of labour costs, especially after the recent minimum wage increase from R69 to R105. “We agree that R69 a day is not a living wage, but many producers, especially small-scale farmers, just can’t afford this increase” he stresses. “At Dwarsberg, some of our permanent workers already earn R100 a day or more. In fact, only our seasonal labourers earn R69. Now we have to pay everyone at least R105. Contact Walter Williams on 023 312 1159.